Lobelia is a genus of flowering plants that includes both perennials and annuals. 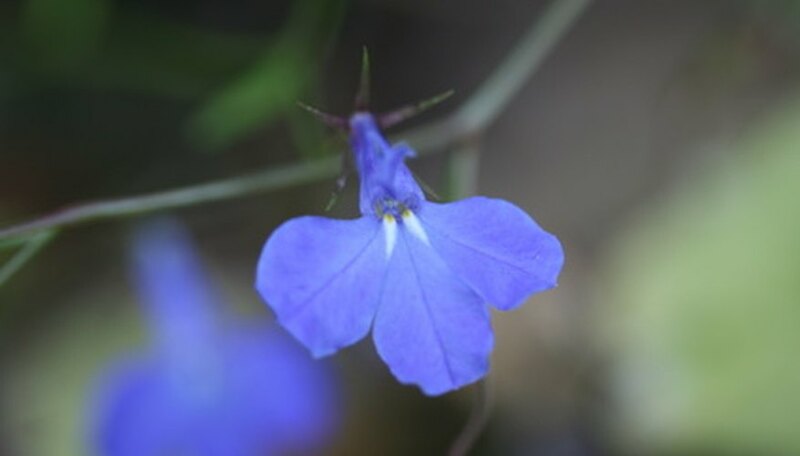 Lobelia is generally grown as an ornamental plant in the garden, though one species of lobelia (Lobelia inflata) has a history that includes its use as a medicinal herb, according to the University of Maryland Medical Center. Common garden varieties include L. cardinales, L. siphilitica and L. erinus. Propagating lobelia from cuttings is not difficult, as the plants tend to set roots quickly. Cut a 6-inch section of lobelia stem that includes two leaves. Take the cuttings while the flowers are still buds. Remove the lower leaf and cut the upper leaf in half with sharp scissors. Dip the cut end of the lobelia stem into the rooting hormone and shake it gently to remove any excess hormone. Mix equal parts sand and perlite together and pour the mixture into the planting pot. Water the soil until saturated and allow the pot to drain completely. Plant the cutting into the soil deeply enough so that the bottom node (where the leaf joined the stem) is buried. Cover the pot with a plastic bag and place it on the heating mat set to 70 or 75 degrees F. Leave it in an area that has bright light (but not direct sunlight). Check the soil periodically and water if the top 2 inches of soil begins to dry out. The soil should feel moist but not saturated. The lobelia cutting should have roots within two to three weeks.